Travel Costs > How Much Do Overweight Luggage Fees Cost? How Much Do Overweight Luggage Fees Cost? Overweight luggage fees can cost you an extra money when you are flying with almost any airline. 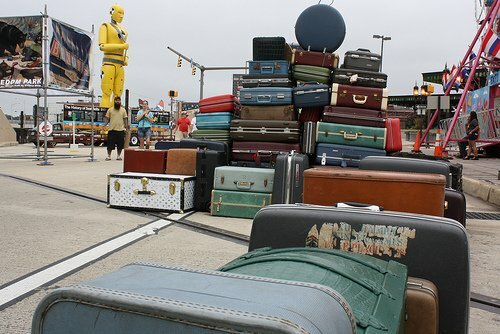 Most of the time, the weight limit on a single suitcase is 50 pounds, and if your suitcase is heavier than this, you will need to pay extra in order to check your bag. How much are airline overweight baggage fees? Be careful when going on vacation. If your luggage is very close to the limit on the way there, you may have trouble on the way back. Purchasing clothing and souvenirs while on vacation is a common practice, and you need to make sure you have the room to get all your new things home while staying under the weight limit. Adding a few new t-shirts could put you a few pounds over the limit. Most of the airlines charge additional fees when the bag’s weight is over 50 pounds. If your luggage is going to be over 100 pounds, they may ask you to break it up or can simply prevent you from bringing it on board. In some cases, depending on the airline policy, they may combine the average of all bags checked in to determine the total weight. Travel light. There is no best way to cut down expenses on luggage than to travel with the prescribed number and weight of bags. If you are unsure of what a bag is going to weight, consider purchasing a luggage scale or using one at the airport ahead of time. Consider shipping your bags ahead of time, especially if they are overweight. Even if the prices are similar, you won’t have to worry about losing your bags during the flight or carrying them around the airport parking lot. If you are a frequent flyer or even hold a premium credit card from one of the airlines, refer to the documentation to see if you can avoid these fees.